FAQ: In listening to two Christians having a disagreement about a personal matter, I’ve often heard one say to the other, “Stop judging me,” or “Stop being judgmental,” as if that is always wrong. What does the Bible say about judging one another? You and I live in a war zone, amidst the battle between the two gods, the God and Father of our Lord Jesus Christ and the Devil (the god of this world—2 Cor. 4:4 – KJV). Satan is the master counterfeiter. What does he counterfeit? Truth. He saw what happened in the Garden of Eden when the first woman omitted words from God’s Word, added words to God’s Word, and changed God’s Word. Later on, in another garden, he also saw what happened when Jesus Christ stood on “It is Written.” The Devil’s goal is to blind people to the truth about Jesus Christ, and to do so he must blind them to truth of the written Word. As children of God who want to glorify our Heavenly Father and our Lord Jesus Christ, we are constantly required to distinguish between truth and error, light and darkness, good and evil, love and hate, spiritual realities and spiritual counterfeits. This often takes place in interaction with other people, both Christian and non-Christian. God’s Word often exhorts us to press in, speak up, reprove and “interrupt” those whose lives are heading in a wrong direction. Yet often when we do, we hear something like: “Stop being so judgmental;” “Judge not lest you be judged;” “Go ahead, if you want to live in that judgment.” Such rebuttals can make us less aggressive in future situations and shut down genuine dialogue at the expense of helping another person and edifying the Body of Christ. Let us go to God’s Word and see if we can find the answer to the question: To judge or not to judge? (44) Then Jesus cried out, “When a man believes in me, he does not believe in me only, but in the one who sent me. (45) When he looks at me, he sees the one who sent me. (46) I have come into the world as a light, so that no one who believes in me should stay in darkness. 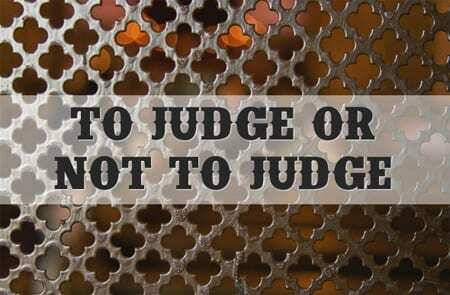 (47) “As for the person who hears my words but does not keep them, I do not judge [krino] him. For I did not come to judge [krino] the world, but to save it. (48) There is a judge [krino] for the one who rejects me and does not accept my words; that very word which I spoke will condemn him at the last day. The King James translates part of that verse by saying that the Word of God “is a discerner” of the thoughts and intents of heart. The word for discerner is kritikos. In English, a “critic” is “one who expresses a reasoned opinion on a matter, involving a judgment of its value, truth, or righteousness.” Hebrews 4:12 is a fabulous verse, and in it we can see that the Word of God not only reveals my transgression (the act), but also my iniquity (the heart behind the act). What is in me too often goes across (as in “trans”-gression) to others. But here’s the problem: my perspective of the Word of God can be distorted. Therefore it could be that what I think it says is not what it really says, and in that case it cannot do for me what Hebrews 4:12 speaks about. This is one reason I personally want many mature Christian counselors in my life. I (and you) am constantly required to judge one thing after another, and I want to do it right. (21) Jesus said to them, “I did one miracle, and you are all astonished. (22) Yet, because Moses gave you circumcision (though actually it did not come from Moses, but from the patriarchs), you circumcise a child on the Sabbath. (23) Now if a child can be circumcised on the Sabbath so that the law of Moses may not be broken, why are you angry with me for healing the whole man on the Sabbath? (18) For such people are not serving our Lord Christ, but their own appetites. By smooth talk and flattery they deceive the minds of naive people. (9) I wrote to the church, but Diotrephes, who loves to be first, will have nothing to do with us. (10) So if I come, I will call attention to what he is doing, gossiping maliciously about us. Not satisfied with that, he refuses to welcome the brothers. He also stops those who want to do so and puts them out of the church. (11) Dear friend, do not imitate what is evil but what is good. Anyone who does what is good is from God. Anyone who does what is evil has not seen God. (12) Demetrius is well spoken of by everyone—and even by the truth itself. We also speak well of him, and you know that our testimony is true. Again we see that the Word of God (the truth) is the only standard by which to judge anything. In the following verse, notice that the Apostle Paul expected people to judge even what he said to them. We will now consider a number of verses in 1 Corinthians involving judgment. In doing so, we will see that we need not know all the motives involved behind what people do but, as Paul did, we are required to judge people’s behavior by the unwavering standard of the Word of God. (3) I care very little if I am judged by you or by any human court; indeed, I do not even judge myself. (4) My conscience is clear, but that does not make me innocent. It is the Lord who judges me. (5) Therefore judge nothing before the appointed time; wait till the Lord comes. He will bring to light what is hidden in darkness and will expose the motives of men’s hearts. At that time each will receive his praise from God. (6) Now, brothers, I have applied these things to myself and Apollos for your benefit, so that you may learn from us the meaning of the saying, “Do not go beyond what is written.” Then you will not take pride in one man over against another. Obviously, Paul’s statement here to “…judge nothing before the appointed time…” cannot contradict the whole idea of discerning truth from error and right behavior from wrong behavior according to God’s Word. The key is not to “…go beyond what is written…” and make fleshly judgments about one another, exalting some people and demeaning others. (1) If any of you has a dispute with another, dare he take it before the ungodly for judgment instead of before the saints? (2) Do you not know that the saints will judge the world? And if you are to judge the world, are you not competent to judge trivial cases? (3) Do you not know that we will judge angels? How much more the things of this life! (4) Therefore, if you have disputes about such matters, appoint as judges even men of little account in the church! (5) I say this to shame you. Is it possible that there is nobody among you wise enough to judge a dispute between believers? (6) But instead, one brother goes to law against another—and this in front of unbelievers! But if we judge ourselves, we would not come under judgment. Two or three prophets should speak, and the others should weigh carefully [judge] what is said. Each person with the spirit of God is to learn God’s Word and think for himself, in conjunction with others in the Body of Christ. (1) You, therefore, have no excuse, you who pass judgment on someone else, for at whatever point you judge the other, you are condemning yourself, because you who pass judgment do the same things. Jesus cannot be saying that we are never to be discerning about ourselves or others. How would we know there is a plank in our eye or a speck in our brother’s? Think about other things he said in the Sermon on the Mount. He spoke about “hypocrites” (you can see the root work “critic” in hypocrite). A hypocrite is one who judges by a false standard. Jesus also said that we can’t “serve two masters” (Matt. 6:24). By what standard do we decide? He also warned about “false prophets” (Matt. 7:15). By what standard do we know they are false? Once again, the point Jesus is making is that we are not to judge by our own standard. Rather, we are to judge by God’s standard. First, I must judge myself by this standard. The more I am aware of the beams in my eyes, the more I am aware of God’s grace and mercy and Jesus Christ’s strength to help me. Jesus does not say we should not be concerned about a speck in our brother’s eye. He simply tells us that we will not be able to effectually help someone else with his issues if we have a telephone pole sticking out of our own eye. The more I am aware of my own “planks” and God’s solution, the more I can see this for you and help you. It is interesting that I must see both my old nature and my new nature in their respective depth and height. In my relationships, I must be especially aware of the “…sin that dwells in me” (Rom. 7:17 – NKJV) and of the spirit of God that dwells in you. That will help me keep myself from judging you according to my perverted standards. It is significant that the Greek word for “hypocrite” refers to a theater actor who wore a number of masks. Thus, a hypocrite is one who appears to be something he is not. The opposite would be someone who allows “into-me-see,” which is a way of understanding what “intimacy” is all about. In other words, I say to someone, “Here’s how Jesus Christ helped me, and he can help you also” (see Gal. 6:1). It is the Word of God that nourishes us and helps us mature so that we can properly distinguish truth from error. (13) Anyone who lives on milk, being still an infant, is not acquainted with the teaching about righteousness. (14) But solid food is for the mature, who by constant use have trained themselves to distinguish good from evil. (11) filled with the fruit of righteousness that comes through Jesus Christ—to the glory and praise of God. True love is based on knowledge and insight into the heart of God. True love discerns what is best. True love is filled with the fruit of righteousness and gives glory and praise to God. Let us put on the mind of Christ by hiding God’s Word in our hearts and acting on it moment by moment. As we do, we will grow up in Him and be able to walk a path of genuine discernment as our Lord did, judging everything by the written Word of God and the word revealed to us by the spirit of God in our hearts.